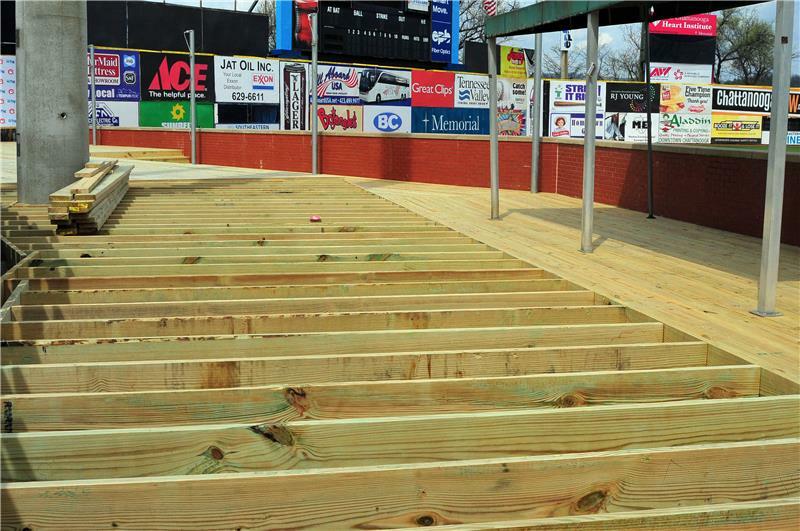 A new Delta Dental Deck down the third base line is being constructed. By raising even the lowest level of seating by over a foot, the Delta Dental Deck will provide fans down the third base line with a great view of the game, even when seated. FSG Bank was introduced Thursday as the presenting partner for Chattanooga Lookouts baseball. Improvements were also announced, including a new deck down the third base line. This multi-year partnership joins together two of Chattanooga’s hometown community businesses. FSG Bank’s presence will be felt by fans throughout their ballpark experience with the creation of a Lookouts’ “Walk of Fame,” chronicling the rich history of Lookouts’ baseball in Chattanooga. As Presenting Partner, FSG Bank will support the Lookouts’ new community initiatives and its customers will also have access to unique fan experiences. The partnership was introduced to the Chattanooga community by Lookouts’ Managing Owner Jason Freier and Jeff Olingy, chief marketing officer, FSG Bank, at a press conference at AT&T Field this afternoon. “FSG Bank is thrilled to be aligned with the Lookouts as both a business partner to the new ownership team off the field and as the "presenting sponsor" of the team on the field, said Mike Kramer, president and CEO, FSG Bank. Opened in 1999, FSG Bank serves the banking and financial needs of the Southeastern Tennessee and Northern Georgia communities, providing retail and commercial banking services, trust and investment management, mortgage banking, and financial planning. Through their experienced team of local professionals, FSG Bank works to develop a sense of community for their clients, starting with the banking experience and working outward into the communities that we all call home. The upcoming 2015 Lookouts season, Presented by FSG Bank, is only three weeks away and will feature ballpark improvements, and new promotions, community initiatives and other enhancements to the fan experience. Though new ownership announced its acquisition of the Lookouts a mere 42 days before opening day, the team has nonetheless embarked on an ambitious program of ballpark improvements for the 2015 season. Fans visiting AT&T Field will see a new Delta Dental Deck down the third base line, a 100% renovation of all 15 luxury suites and a reconfigured Budweiser Lounge on the first base side of the ballpark. The Delta Dental Deck will be a two-level, wide open party space with great views of the field. Installation of the deck will create a perfect area for group outings and a more social space at the ballpark. By raising even the lowest level of seating by over a foot, the Delta Dental Deck will provide fans down the third base line with a great view of the game, even when seated. 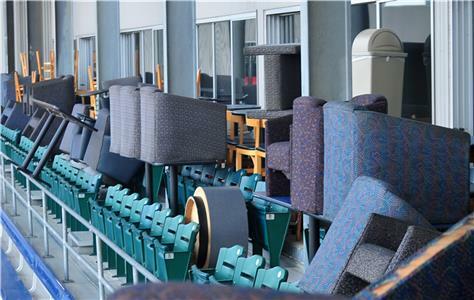 The Luxury Suites at AT&T Field will also be completely renovated and updated for 2015. Every suite will receive new carpet, paint, furniture and décor as well as new, larger flat-screen televisions. Lookouts’ fans will also have new ways to experience the suites in 2015. Suites will be available for half (35 games) and quarter (17 games) season ownership as well as in five, seven and ten game packages. Two redesigned spaces on the suite level—the Lookout Loft and Killebrew’s Korner will be offered in 2015 as “all inclusive.” The Lookout Loft will provide all-you-can-eat food and drink included for one base price. Another group area undergoing changes is the Budweiser Lounge, which is being refit as an exclusive group area. Adjacent to the Budweiser Lounge will be a new concessions stand giving fans the opportunity to grab a hot dog while still keeping track of the action on the field. The Lookouts will also improve the fan experience by investing in the ballpark’s food service capabilities. New equipment is being installed in the main concessions area, allowing a wider variety of items to be cooked and served fresh to customers. The team will also be placing a new food cart on the ballpark concourse where fans can enjoy premium items, like Philly Cheesesteaks, prepared right in front of them and served hot off the grill. • Kids will be able to come onto the field and run the bases after every Lookouts game in 2015. • All Thursdays, starting with Thursday April 16th, will be “Thirsty ThursdayTM “at AT&T Field with drink specials starting as low as $2. • Sundays will be “Autograph Day” at the ballpark. After every Sunday game fans will be able to meet and get autographs from some of their favorite Lookouts players. The Lookouts will also be extending their outreach into the community. One of the first examples of this will be to invite the community “in” through the Community Partner of the Game, which will be presented by FSG Bank. This program will give local non-profit organizations the opportunity to gain visibility, share their message, attract volunteers and raise funds. “A big part of our collaboration with FSG Bank stems from our mutual desire to enrich the lives of those in the Chattanooga area and help those who share in that goal,” said Freier. “FSG Bank was thus the perfect partner for the Community Partner of the Game.” FSG Bank will assist the Lookouts in identifying and selecting the area non-profits that will be the beneficiaries of this program. The 2015 Lookouts Home Opener is on Wednesday, April 15th at 7:15 p.m. against the Birmingham Barons. Opening Weekend will feature the team’s first Fireworks Friday of the season (Friday, April 17), an appearance by the World Famous ZOOperstars! (Saturday, April 18) and Dogs on the Diamond (Sunday, April 19). Fans can reserve their tickets for Opening Weekend and other home games by calling (423) 267-4TIX. Furniture is stored outside each suite while a 100% renovation of all 15 luxury suites moves ahead. Every suite will receive new carpet, paint, furniture and décor as well as new, larger flat-screen televisions.